Choose quality clothes that save money, last longer and reduce waste. Poorly made clothes wear out quickly, clutter closets and use up precious natural resources. Well-made clothes are available for every budget, are built to last, and can be worn often and for years to come. Quality clothes just make sense. 6:30-7:00 Hear about program and individual achievements. 7-8:30: Update on recycling and back to basics. Help Recruit for Spring Course! Do you live in Clackamas County? Spend a few of your Master Recycler hours inviting others to join the movement! Libraries, community centers, places of worship, schools, and workplaces are all great places to distribute post cards. Don't Forget to Report Hours! A big thank you to our two newly certified Master Recyclers! Harriet Roth (Class 61) completed her 30 hours by sharing tips on preventing food waste, improving recycling and reduce and reuse at Farmers Markets, the St Johns Bizarre and the Fix-it Fair. She also acted as Green Team Lead training, supervising and troubleshooting recycling for the Oregon Brew Festivals for the past couple of years. Stephanie King (Class 64) has been planting the seed of sustainability in a challenging place! She works in the Columbia Gorge Outlet Mall and has been able to make some impressive headway with improved recycling, starting a mall newsletter and even starting a green team where she found a fellow enthusiast to help tackle the project. 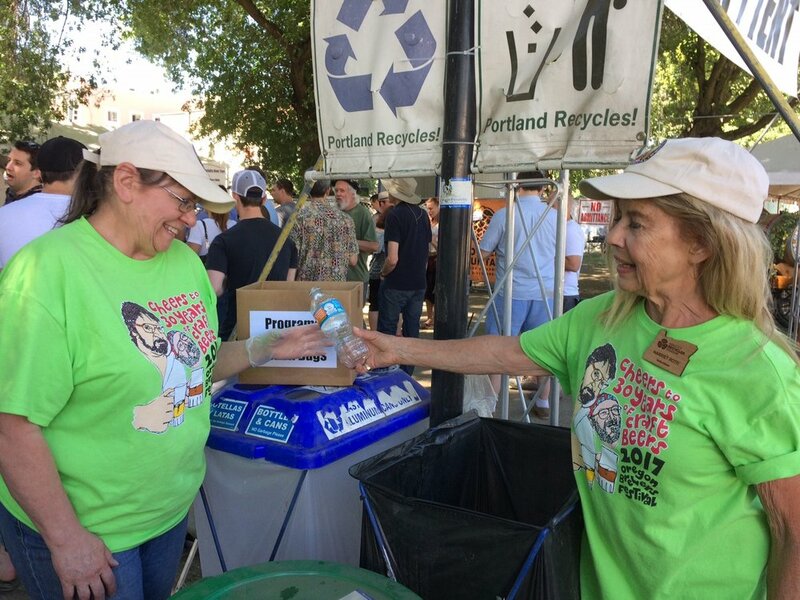 Meanwhile Stephanie also joined the Gresham Earth day Community Recycling event and staffed a table on food waste prevention at the Edgefield Cracked Pot. 2018 Call For Artists for GLEAN is open! Applications will be accepted via CallForEntry beginning January 1, 2018 with a deadline of January 31, 2018. We are again dedicating one residency position for a student currently enrolled in an art program at a local college or university. Student applications will be considered separately from other artist applications. GLEAN seeks to hear from artists with a broad range of experiences and cultural perspectives from the diverse communities in the Portland area. For more information, contact Amy Wilson at nowaste@comcast.net. $5000 Seed Money Grant (awarded fall 2018) for the organization best able to succeed in building a Gentle Disposition Worker-Owned Cooperative. Gentle Disposition is a beautiful service for families who have lost a loved one and need help taking care of the things left behind, or need an entire home cleared. We donate everything possible, and then reuse and recycle as much of the rest as possible. A year ago, I sadly put Gentle Disposition on hold because my father had become terminally ill. Five months ago he passed, and I’m awarding this grant in his honor and seeking to train and support organizations in building Gentle Disposition worker-owned cooperatives. All groups that demonstrate capability will be able to receive free training and support; the group that proves most likely to succeed will be awarded the grant. For some background on me and my social enterprise history and long term vision, watch my short story, Poison into Medicine. Please forward this to any generous-portion-serving restaurant owners and staff you think would be interested in hearing about Halves and having a chance to provide input! I'm happy to show appreciation by buying a meal or bringing donuts or something. Halves is a ideal donation program for restaurants serving generous portions to diners with smaller appetites. Diners who choose to participate pay a little more for their meal (perhaps $1.50) and receive a little less food. At the end of meal shifts money is shared between the restaurant and the Halves program. Part of the extra money goes to the restaurant to cover costs for packaging and delivering leftover food (does not have to be the exact food ordered - just an equivalent amount) to organizations feeding the hungry. Part goes to compensate staff for the extra effort, and the rest goes to support the Halves program. The Elf pictured below will be the vehicle used transport food. I'm hoping to talk with 8-10 people as a start and hear thoughts about how to make the Halves program as attractive and rewarding for restaurants to take part in. Ideally, I'd like to talk to more owners to get feedback on parts of the program that may require decisions on their level. Thank you so much for sharing this, and I encourage those you share it with to share it with anyone they think would be interested!